Effortless style that whisks you away to the beach perfectly describes the look of our Harbor Collection. 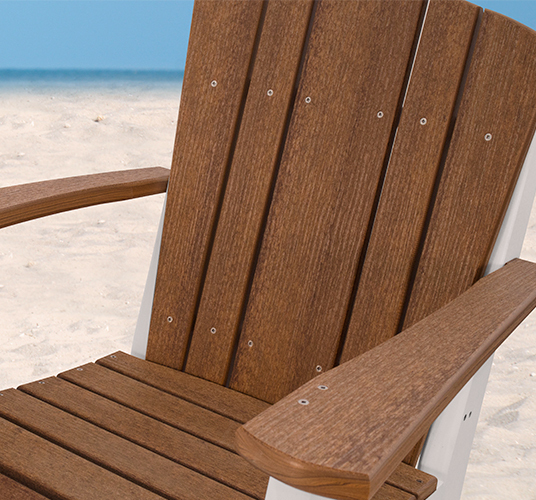 This collection gets its seaside appearance from its curved edge back, inspired by the classic, rounded Adirondack chair shape. Each seating style also showcases a thick center slat and waterfall edge seat to make leaning back and getting up easier. The Harbor Collection features many different patio furniture styles, all made from durable poly lumber that is resistant against salt spray, UV rays, and insects. All of our poly lumber collections, including the Harbor, is made in the U.S. by Amish craftsmen. Get the family together for dinner under the stars with the Harbor bar stools, chairs, and tables or enjoy your morning coffee from an Adirondack chair, glider, or rocker with a matching ottoman not too far away; the Harbor Collection can solve all your patio furniture needs.